About eight years ago, I interviewed an Executive Recruiter for a mini-podcast on the how-to’s of cold-calling. To quickly access the interview click here. Although I’ve sung the praises of cold-calling for decades, it still hasn’t caught on much with lawyers even though it’s one of the best ways to find business quickly. Nor has cold-calling gone out of style because what jogged my memory is this piece in Entrepreneur which offers some additional tips on how to use cold calls effectively – such as advance research, educating the prospect and of course, follow up. When I started out, cold calls helped me find some of my first clients by sending them copies of an article that I’d written and also put me in touch with lawyers who sent me business. 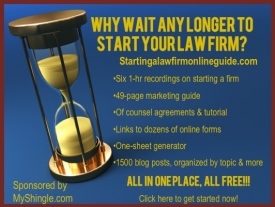 Later on in my practice, a cold call connected me to an attorney who eventually agreed to handle a matter of constitutional significance on a pro bono basis for a group of clients. On the other hand, I’ve also been off-handedly dismissed or even asked pointedly “I guess businesses must be slow.” And of course, some folks are unavailable or won’t call back. Have you ever tried cold calling? Share your experience below.